The work is intended to be played in solo tuning, that is in E-, key well working to play the highest notes in the score with natural harmonics. This revision lets Scontrino’s music accessible to read to the modern bassist, transposing the music one-seventh higher, in E-, the key the author intended to play on the double bass. A question remains, but probably can’t be solved: why in 1871 edition was not engraved a solo part in E-, rather than the one in F#? Scontrino was living in Milan, at that time, indeed. 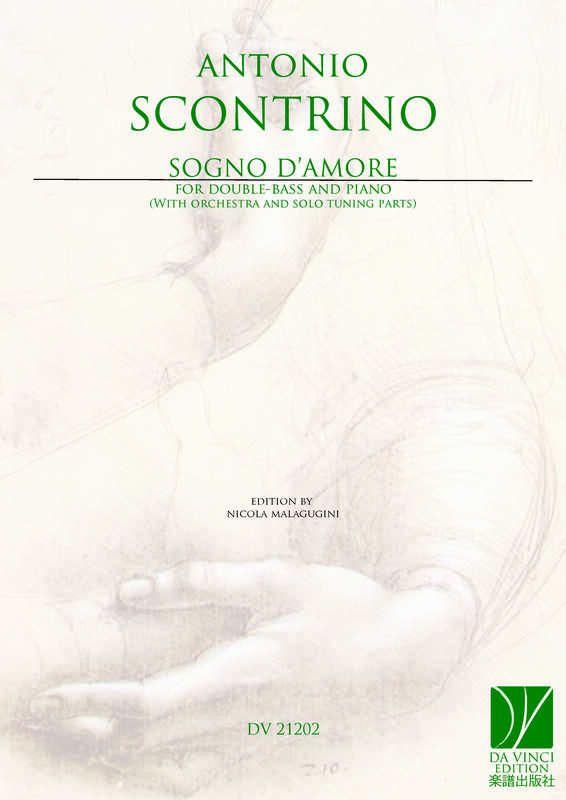 This edition maintains original slurs, and it proposes practical bowings for the very long successions of notes out of tempo, featuring Scontrino’s music. It doesn’t contain fingerings. To help the execution in the different repertoire contexts, it is supplied a piano part for solo tuning and one for orchestra tuning. Antonio Scontrino: (b Trapani, Sicily, 17 May 1850; d Florence, 7 Jan 1922). Italian double bass player and composer. His father, a carpenter, was an ardent music lover and amateur instrument maker. Antonio joined the family orchestra at the age of seven, playing on a cello adapted to serve as a double bass. From 1861 to 1870 he studied at the Palermo Conservatory where his teachers included Luigi Alfano (harmony) and Pietro Platania (counterpoint and composition). He then toured as a double bass virtuoso throughout southern Italy. In 1871 he obtained the libretto of an opera from Leopoldo Marenco, but the work, Matelda, was not produced until 1879. Aided by a grant from the municipality and province of Trapani, Scontrino went in 1871 to Munich, where for two years he studied German music. In 1874 he went to England as a member of Mapleson’s orchestra and afterwards settled in Milan as a teacher of instrumental, vocal and theoretical music. He was appointed professor of counterpoint and composition at the Palermo Conservatory in 1891, and the following year gained a similar professorship at the Istituto Musicale in Florence.